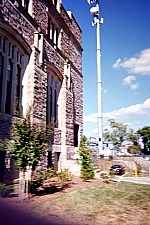 A cell phone tower was erected at the Catholic University of America campus between Father O’Connell Hall and the building’s parking lot. Verizon and AT&T are the two-telecommunication companies that provided the technical support for the tower. Normal college life was non-existent for Catholic University of America college students who eagerly welcomed the first visit of Pope Francis to the campus. Pope Francis celebrated Mass at the Basilica of the National Shrine of the Immaculate Conception in honor of the canonization of American missionary Blessed Junipero Serra on September 23, 2015. 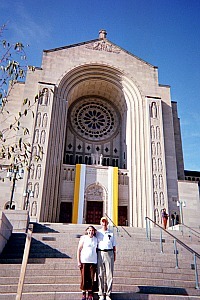 The Basilica is located near the Catholic University of America campus. The tower transmitted the cell phone signal coming from the individual tweets of people gathered to attend the special Mass. In addition to supporting each cell phone signal of those attending the Mass, the tower also facilitated the use of calls through mobile networks in case of emergency. Although Pope Francis doesn’t carry a cell phone with him, individuals using mobile phones while following the pope’s travels around the world capture a large barrage of social media tweets, posts, pictures and video streams. Pope Francis has learned the value of social media as a modern means of communicating the messages of a 2,000-year-old church around the world. 23 million people follow him globally on Twitter speaking nine different languages. 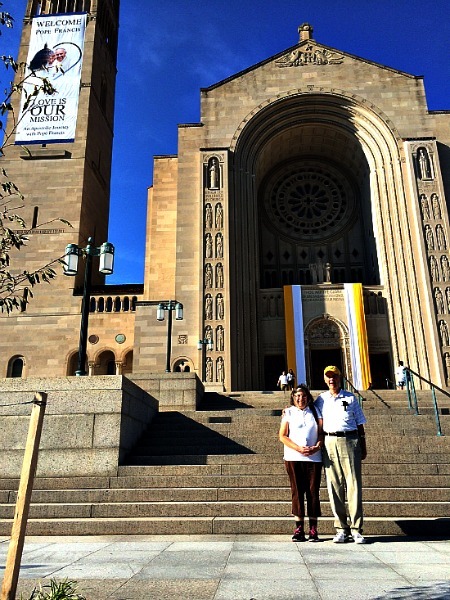 The tower at the Basilica of the National Shrine of the Immaculate Conception transmitted Twitter hash tag signals such as #PopeInUS and #WalkWithFrancis. The visit of Pope Francis to the American cities of Washington, D.C., New York and Philadelphia provided people with opportunity to use social media channels for pictures of Pope Francis for their scrapbooks. It was an important event for many people who will remember the momentous occasion for years to come with snapshots and video snippets. Mobile networks rely upon cellular service equipment to transmit a cell phone signal through technical equipment. Each mobile phone provider installs the equipment at cell sites. These can be cell towers installed on top of buildings. Antennas placed inside buildings or underground may also be used. Each site can only transmit a designated number of simultaneous connections through different multiple connections depending upon the equipment provided by each cellular provider. Cellular companies estimate the demand for cellular phone usage by determining how many people will need simultaneous service within a given area. Each cellular provider will determine the number of cellular sites to be placed in one location according to the previously determined demand for the cellular service. When there is a large gathering of people in one spot and everyone is using a cell phone at the same time there is competition. The same tower handles the transmission of each individual cell phone signal. The solution to the reduction of this transmission bottleneck is to add additional permanent or temporary sites. The temporary cell phone tower installed at Catholic University campus was installed to handle the increased cell phone signal transmissions in attendance at the special Mass held at the Basilica last September.